Since I posted part one of this mini-series, several other bloggers have also covered the events at the Dogme Symposium at IATEFL 2011 in Brighton. In doing so, they also described more or less all of the issues that were raised during the Q&A session and gave their own responses to them. I’d like to gather the responses to the event that I have read here as in many ways they are more eloquent than I could manage, and add my own reflection towards the end by way of a coda. 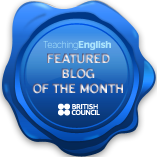 Helen Strong (Spotlight) – who even made the event part of a lesson! If you have also written about the event, but aren’t listed here, it isn’t deliberate! Please send me the link as a comment so I can read your work and (if you like) refer to it here: thanks! It was strange sitting at the front of the room as Scott invited the 250-odd people to “have a final ‘burble'”. During these burble-stages, it had proven irresistible to wander round and listen in – old teaching habits die hard. Then, eventually, the questions came. Scott mostly dealt with this one, referring to the fact that working with emergence was likely in time to cover the same kind of areas of general language competence that a good exam would test. This could be mapped retrospectively onto a syllabus for transparency. This led to a further question about how do you do exam practice without materials (in this case, exam past papers and example questions). some ideas proposed were to have learners create their own, and in so doing gaining a deeper appreciation of the nature of such tasks. My own take on this is that we are talking here about Dogme ELT, or Dogme English Language Teaching, not Dogme EQT, or Dogme Exam Question Testing. Developing language competence in a materials light, conversation driven, emergent way can live together with a material-focused, task-driven, pre-determined approach to training exam technique and strategy because they are different animals. They are not mutually exclusive. Unplugged teaching, for me, is about exhaustion of used resources if resources have proven necessary: to prepare properly and ethically for an exam, I think real examples of questions and live experience of exam papers under test conditions are necessary, and so should be part of an otherwise materials-light class. That said, if such materials are brought in, the teacher should bleed them dry – there is a lot more to be squeezed out of an exam question than 15 minutes of learners trying to answer it. After the symposium, some people commented that they had wanted to respond to this concern by saying “what would anyone be doing sending a fresh CELTA grad to work with a high-powered CEO anyway? !” Diarmiud Fogarty makes a similar comment on his blog, for example. At the symposium, I went so far as to say that I, even with over 15 years of teaching experience (much of it working with high-powered German professionals), “have a very difficult time”, even if I have materials and a plan: that is the nature of work with such students, not a weakness of unplugged teaching. I also pointed out that coccooning teachers in materials and a plan won’t necessarily save them from students noticing that they aren’t being given what they want. I referred to this talk by Mark Powell, someone whom most of us would agree is an experienced and capable business English teacher. Somewhere during this very informative and funny talk (which, incidentally, suggests to me that Mark is at his best when he ditches his own coursebooks and goes unplugged! ), he tells a story about a time when his “best laid plans” and pre-determined language agenda was summarily dismissed by his students; he could handle it – basically by going dogme. My question to you is, what would be fairer to a “fresh CELTA grad” if you were sending them that day to do Mark’s job? To give them the plan (and leave them open to a rude awakening that they probably couldn’t recover from in the lesson), or prepare them to work unplugged by brainstorming a set of questions likely to tease learner’s needs and language out of them, and simple ways of working from there? A camera team were filming a pride of lions in the Serengeti. One of the lions spotted the team and growled ominously. The Soundman said to the Cameraman: “sounds hungry”. “Um”, said the cameraman. A few minutes later, the lion got up, growled some more and slowly advanced towards the distant jeep with the camera team. The cameraman kept filming, but slipped off his sandals and pulled out a pair of running shoes from his bag. “I don’t have to outrun the lion…” the cameraman replied. Interestingly and co-incidentally, Evan Frendo just blogged a contrary position to this in a collection of so-called Business English Teaching myths. Some people misrepresent through overstatement the need for business English teachers to be technical lexical experts in their students’ specialist areas. Such knowledge is sometimes important but perhaps not so often as to mean that a teacher lacking this knowledge cannot be highly useful for a learner in the majority of their development needs. More important traits for a teacher (it seems to me) in a case like this would be curiosity, ingenuity in using information search and intelligence enough to know what they don’t know and need to find out about. These aren’t subject specialist characteristics, but they are the characteristics of a teacher capable of working unplugged. If I didn’t know his position better, it would be easy for me to think that in Evan’s world, a competent business English teacher is not far removed from a dictionary. I do, however, know his position better (or at least I think I do!) and I therefore think this is not what he is really saying. Just as, if you don’t know the “teachers only need to be one step ahead to help” position better, you would mistake or misinterpret it to mean “teachers can get away with ignorance”. Of all the questions that emerged during the course of the conversation, this is the one which stuck with me, mostly because I didn’t actually respond to it then and there. The person who made the comment obviously was concerned for the educational well-being of learners and the professional development and confidence of new teachers and I have full respect for that position and for his concerns. However, I think he made the comment because it had an inaccurate impression of what was meant on the day by “unplugged teaching” and “unplugged teacher training”. I think the speaker felt concerned that we were robbing our trainees of the opportunity to learn how to work within a considered and coherent syllabus, and thereby setting them adrift in the boundless treacherous ocean of language learning without a sextant. No one, including me, is advocating that people beginning to learn to teach simply walk into a room of learners and “see what happens”. While this still may not be “dangerous” in any meaningful sense of the word (at lest, for me), it could perhaps fairly be labelled “irresponsible”. But this is not what unplugged teaching is, and it is not what goes on in our initial training courses, for example. If the person who had these concerns during the symposium ever reads this, or if anyone knows him and reads this, please visit this site (or pass him the link) so that I can give you a clearer view of what we are doing in our teacher training work than I was able to do in the 15 minutes of talk-time available: I am confident that you will be reassured that we are far from being “irresponsible” and “dangerous” – or at least, not dangerous for our trainees’ and learners’ well-being and genuine development! So that brings my summary of the Dogme Symposium to a close – but you can take the long conversation further by writing your memories and impressions here as comments or sharing links to your own reflections elsewhere. This was one of the true highlights of my professional life thus far and I would like to thank the people who made it truly special: those of you who came and all of you who got in touch afterwards with feedback. It couldn’t have happened without you. Hi Anthony, brings back great memories of the symposium. My recent post was on dogme: http://tinyurl.com/6hk7332 I remember teaching a high-powered Italian businessman who ended up teaching me about grammar, we had a great lesson on contrastive linguistics. Thanks for stopping by, David. I had a similar experience to yours, but mine was with two new pairs of shoes! I had read your post when it came out, but neglected commenting – Dave’s cautionary note not to overlook questioning new tools, especially when they come wrapped in educational clothing, chimes with me, I must say. question is not the same as criticise, query is not the same as reject, question is not the same as scepticism 🙂 Which is why I like your blog: a refreshing blend of presentation and reflection. Hi Anthony, thanks for the comments about my blog. Edward de Bono says the saying “if it ain’t broke, don’t fix it” is not useful. Instead, we should always be questioning things, not just trying to fix problems when they arise. I bloody well hope it happens again! Glad you liked the story. I think I got it from Billy Connelly, but to be honest, I’m not sure. I can imagine using it to contextualise the grammar mcnugget (not) have to, which is a notorious issue for German speakers! Thank you for pointing out my “contrary positon”, although I have to say I wasn’t talking about lexical expertise, but discourse. Quite different things. A lot of the sociolinguistic research on workplace discourse is showing that it has certain characteristics which are different to “normal” discourse. I don’t think I mentioned lexis at all. Fair point, Evan, and thank you for helping me understand your position better in our exchange over on the BESIG World Blog. Still (while I have you here 😉 ) do you think that current published materials for BE (which is where the majority of teachers working in the field may be drawing their inspiration for lessons, if not the lessons themselves) pay sufficient attention to the discourse level that interests you, or is there too much focus on the lexical level and treating skills in a context- and culture-neutral (or Anglo-centric) manner?